Several weeks ago, I started a poll asking whether it's a good time to be buying bloodstock. Over 61% of you said that you would at least consider purchasing a broodmare if you could find a good deal -- and only 16% said that you're trying to sell off some of your current herd. See the full poll results here. Sounds to me like there are prospective bidders out there. And from what we've seen so far this auction season, there are opportunities galore for someone wanting to get well-bred Thoroughbred mares at a fair price. 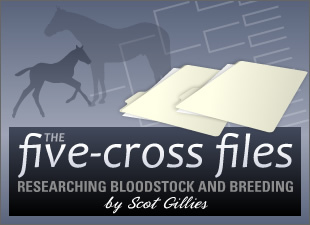 We're seeing a real correction to the bloodstock industry, and a lot of breeders are culling their broodmare herds without placing the standard reserves on the mares. Combine that with generally lower demand, and you might wind up taking home a well-bred mare today for $10,000 that would have been a $30,000 R.N.A. a couple of years ago. With that in mind, I'd like to hear how you approach a big sale. Say you have a limited budget -- we'll use $20,000 as an example. You've identified a dozen hips that you'd be happy to buy. You might spend it all on one hip, or you could possibly stretch it out and get two horses that interest you. If you bid on the earlier hips, you're likely to deplete your funds before the sale ends, and you could miss out on some real bargains in later sessions. On the other hand, if you hold on for a later hip, you run the risk of finding out that someone else wants the same mare, and you'll go home empty-handed. So, readers, how do you handle the strategy behind auction bidding to make sure you wind up happy? This isn't entirely hypothetical -- I'm actually in this situation now. I have a limited budget and hadn't really planned to buy another mare this year -- but with prices so far south of previous years, I'm taking advantage of the situation and will probably buy at the Keeneland November sale. This sale is structured to encourage early bidding -- hips are ranked according to expected value, with early books having the higher-priced offerings. I now have 16 mares identified that I'd like to bring home, and which are conceivably within my price range in a "bargain" atmosphere Theoretically, I should just go through my list and bid up to my maximum as each of those 16 hips goes through the ring, since (again, theoretically) the best-bred mares come through the ring first. But would bringing home two mares from later books be better than purchasing one mare from, say, book three? I have a pretty good idea how I'll proceed -- but I'd enjoy hearing your strategies. Do you do a pros-and-cons list? Come up with a maximum bid for each mare on your list? Just wait for the mares that you'd like most, and avoid temptation to bid on others that come through earlier?